The aim of the GASVESSEL project is to integrate the innovative pressure cylinders in a cost-effective waterborne means of transport. A novel ship design, developed by GASVESSEL partner Navalprogetti will make it possible to convey great quantities of compressed natural gas, allowing the reduction of transportation tariffs associated with a low environmental impact. Currently, the ship designed for the three geo-logistic scenarios (Black Sea, East Mediterranean and Barents sea) has a carrying capacity of about 15 000 000 Standard Cubic Meters (SM3) of gas at a pressure of 300 Bar. The first practical test of the ship design has already been successfully executed. In August 2018 Navalprogetti visited the Krylov State Research Centre in St. Petersburg which is in charge of the tank model tests. A wooden ship model has been built at the Institute and was tested in a basin to confirm the theoretical expectations of speed, power requirements, maneuverability, and seakeeping attitude in practice. 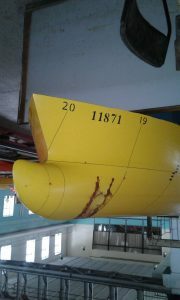 The gathered results are now being evaluated to improve the hull shapes of the ship. The basic ship design is progressing well and the general plan together with the technical specifications are almost ready. On a later stage, these documents will be handed over to GASVESSEL partners HLL, the shipowner, and ABS, a classification society. Based on the approved ship design by ABS, HLL will define the operative costs of the ship. The first HAZID (Hazard Identification) session is planned by Navalprogetti and ABS during the months of October and November 2018. During this session, all safety measures for maritime transportation will be defined, which could have a significant impact on the completion of the ship design. In the meantime, the structural hull design is progressing by keeping in due account the mitigation actions defined during the previous Approval In Principle (AIP) phase with ABS where the feasibility of the ship obtained the green light.